Music Nomad's HumiReader is a humidity and temperature monitor that is accurate, reliable, and easy to use. Perfect for acoustic guitars, electric guitars, mandolins, ukuleles, and orchestral strings, the HumiReader monitors your instrument's environment, which is critical to ensure that it stays within the manufacturers warranty and to protect your prized instrument from drying, warping, shrinking, or cracking. 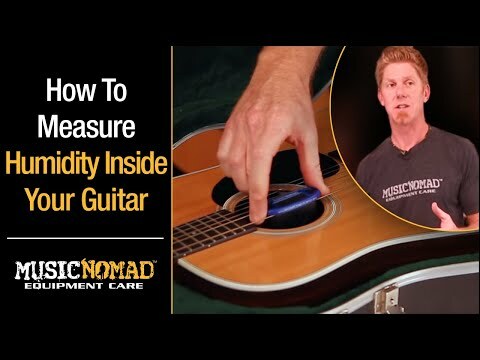 This innovative design lets you customize where you want to measure, allowing you to hang the monitor from your acoustic guitar strings and measure inside the sound hole. You can also measure inside the case near the headstock or fretboard/fingerboard with the Case Holster, which has a strong adhesive backing that sticks in your case and holds the HumiReader. Or just place it in any room you want to monitor. Our accurate sensor monitors your string instrument's environment every 20 seconds and gives you the humidity and temperature readings on an easy-to-read LCD display. It provides the maximum and minimum range over the period you are measuring and can be reset at any time. It also features a reminder on the humidity and temperature safe zone you want to keep your string instrument, a long-lasting AG 13 battery, and Fahrenheit or Celsius readings. Protecting your string instruments just got easier. Do you own MusicNomad MN305 The HumiReader or have you had a chance to try it?